January’s Fresh From The Oven Challenge is Khrushchev Dough. Apparently this butter rich dough was the favourite bread recipe of the Russian leader Nikita Khrushchev. It was left up to us to decide how to shape and fill the bread. I rolled and stuffed some like Serbian Kiflice, tiny stuffed cheese rolls. I made one third with a mix of Philadelphia and cheddar and another batch with what is known in our house as ‘Pongy Cheese’ but in the real world is called Garlic and Herb Boursin. Oh, and just to confuse you the round one here has both cheeses and I sealed it into a round bun. Don’t try that. It didn’t really work. …then sliced it into 2 inch chunks. I tried a rolling pin to flatten them out, but it got too sticky with Nutella, so I went for a hand squashed approach. 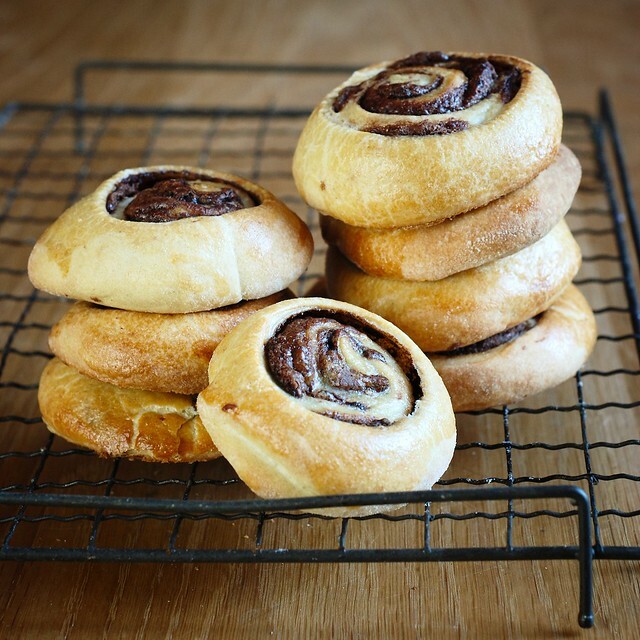 Chocolate swirly things fresh from the oven. I made a few swirly ones with the pongy cheese as well, and they were all delicious. The boy loved the chocolatey ones warmed up for breakfast. My cheesey rolls have been sick! I am fascinated by this dough as it breaks all the bread rules, mixing salt with yeast, using cold water, cold proving and working with fridge cold dough. Somehow it all works though. Below you can read the recipe from Silvia and Ivan from the Bulgarian mushitza blog. Thanks for sharing Silvia and Ivan. Here is Silvia and Ivan’s text which is a joy to read! Hello Bakers! Happy, Happy New Year! Let it be full of tasty and bold baker’s deeds for all of us! We are Silvia and Ivan from mushitza and it’s our honour to host the first challenge for this year. We are from Bulgaria but decided to show you a Russian recipe since it’s our favourite snack and breakfast recipe. Besides it’s very easy. But you have to forget everything you know about the dough when it comes to this one. It’s said that this was the favourite dough recipe of the Russian leader Nikita Khrushchev. Thus came the name – Khrushchev dough. 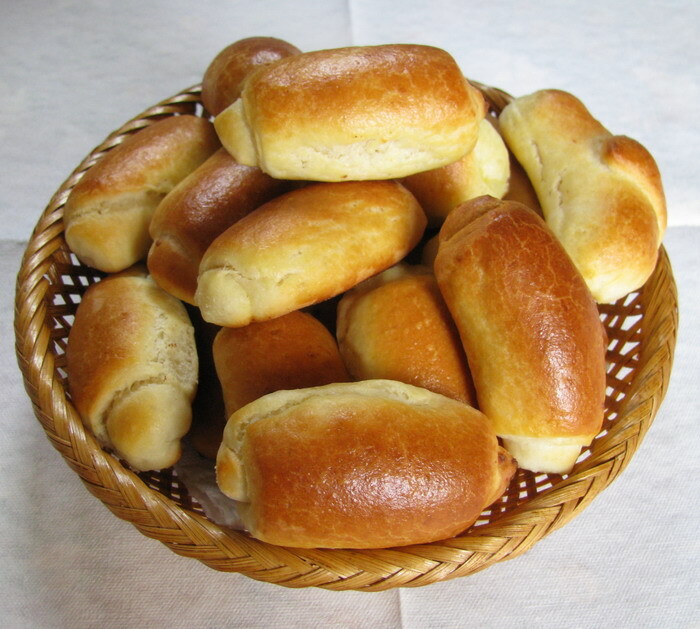 He liked it fried as pirozhki but we usually make out of the dough little baked cheese rolls, similar to Maya’s kiflice or croissants. This is the strangest and irrational dough recipe but it always works. Never mix yeast directly with the salt. Exactly the opposite is what you have to do here. Since the salt kills the yeast when in direct contact we are using double amount of the yeast than we would usually use for this amount of flour. Leave the dough to temper for an hour or two after taking out of the fridge. Not here. 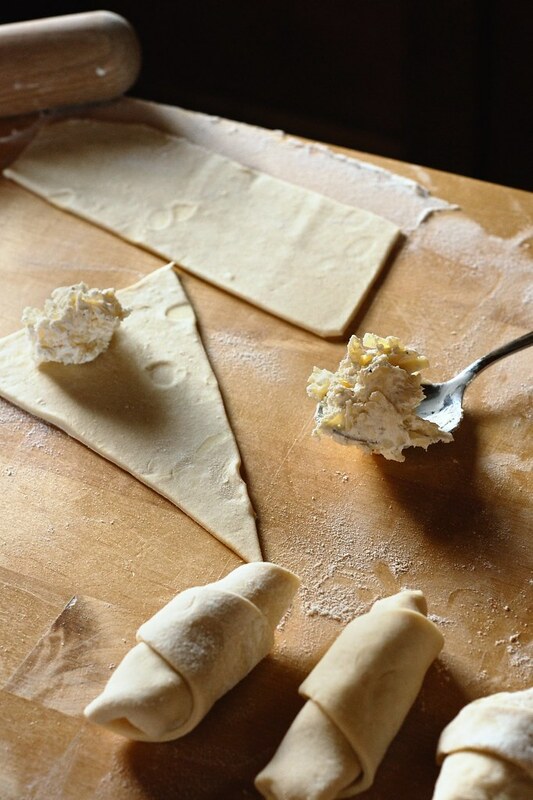 Work with the dough directly when out of the fridge. It’s essential for the dough to be cold, otherwise the butter will start to melt and absorb more flour which isn’t desired. We must specify that this isn’t the original recipe, it’s our version of the recipe. The original recipe uses margarine and the fat is in bigger amounts, but we don’t use margarine and have always made it according to this version. Notes: For mixing and kneading the dough, normally, we are using electric mixer equipped with the dough hooks. But it could either be used a wooden spoon. If needed at the end we are turning it a couple of times by hand, but to be honest I prefer not to touch it in order not to soften the butter too much with the warmth of my hands. It have happened to me to decide to make the dough impromptu with butter directly out of the fridge. In this case it was enough just to cut the butter into small cubes (1 cm). Do not melt the butter. If using fresh yeast: Using an ordinary tablespoon rub the salt through the yeast block till it becomes liquid. If using dry yeast: Mix salt and dry yeast, then add the water. Add in the milk, butter, sugar and sift the flour on top. Mix with an electric mixer equipped with the dough hooks till all the ingredients are combined and soft dough forms. A wooden spoon could either be used. Cover the bowl with an airtight lid or plastic wrap and place in the fridge overnight. The dough becomes firm in the fridge (since the butter goes firm) but it does rise slowly. Although the original recipe says it doesn’t, we are making it every quite often for more than five years, and it always rises, not as much as the other doughs but it rises nicely. 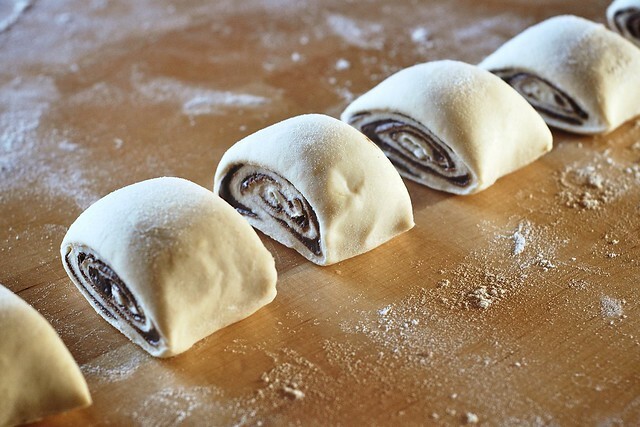 The next morning, dust the counter with flour, place the dough on top, roll it out and shape it as you like. Work the dough as soon as you take it out of the fridge. If needed divide it in two or three parts and place one part in the fridge while you are forming the other. We’ve never freezed the dough but according to the Russian forums there’s no problem of doing so after the overnight proofing in the fridge. When you want to use it, leave it overnight in the fridge to defreeze. What to do with the dough? 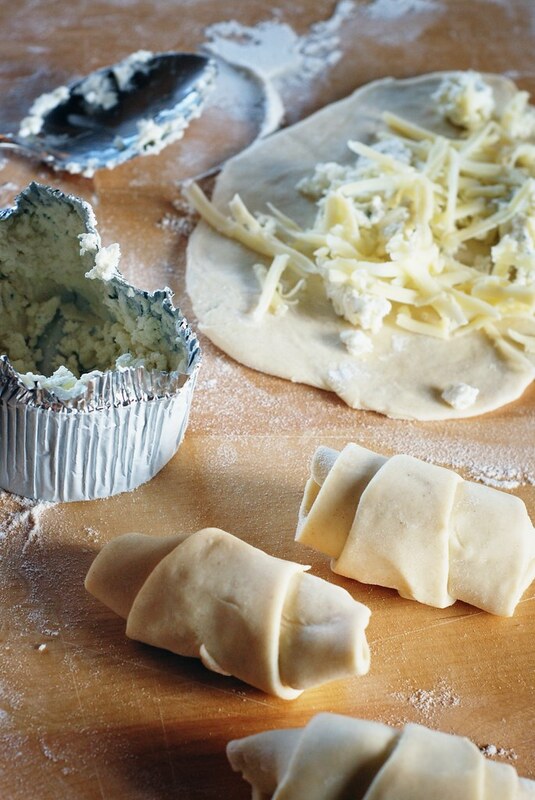 Take the dough out of the fridge, divide it in two and return one of the parts in the fridge. Dust the counter with flour and roll the dough out to 3 mm thick rectangle. Cut it lengthwise and widthwise to smaller or bigger rectangles. Place some grated feta, cheddar or whatever cheese you have in the fridge and roll the rectangles up to tight rolls. All kind of jams, preserves, nutella… could be used. Arrange them in a baking pan living some space between them since they rise in the oven. Brush the rolls with a mixture of egg yolk, a few drops of water and a few drops of vegetable oil. Bake for around 15 minutes or until golden brown. But there are many other treats that could be made with this dough.Baked or fried. Like doughnuts, sweet or savoury rolls, pizza, pirozhki, bread and whatever you like no matter sweet or savoury. You could get some inspiration from these photos. It would be really interesting for us to see your variations and hope you’ll enjoy it as much as we do! We were very nervous about this challenge, because we know how strange the recipe sounds. And now it’s a great fun to see how creative everybody was. We are gathering ideas for the filling and shape as we need to modify our boring way of making these. Yours look amazing! I did nutella ones too! Gotta love a chocolate filling. 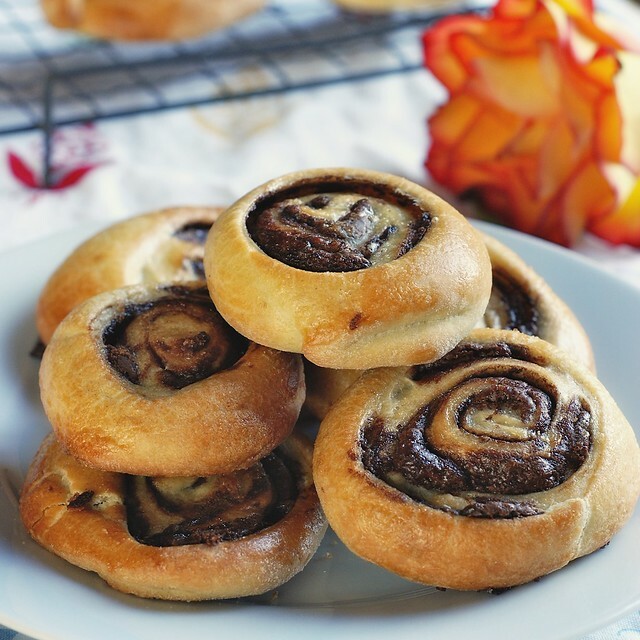 Yours look so pretty, like yummy nutella cinnamon rolls! Your pictures are really great. Thank you for taking part. These look delicious especially the nutella ones. Great photos as always. Your photos are great! We’d love for you to share your recipe and images at dishfolio.com! OMG! I am in love with this picure of swirled chocolate ones sitting on a rack! Amazing shot! Besite that, I am in love with the dough, too. It is simple, easy to work with, and tasty. Forgot to mention about leeking cheese. This dough is fatty one, its layers does not stick together as with dough for kiflice. So as edges were not sealed hard, the cheese foud its way out. It happens to me all the time I make kiflice with some beer-fatty dough, filled with jam. Please, consider onother method for rolling and cutting the rolls. Make one long roll-log, then use a plate with thick edges, to cut though the log, as you would use a pizza cutter. It is powerfull method, as the “blade” is not sharp, so it cut and stick the edges of each roll athe the same time. You’ll find pictures of this process at my blog. Not posted mine yet but I loved this dough, especially in pizza! Your photos are gorgeous! Congratulations on the FoodPress feature. I am bookmarking this recipe to try out. 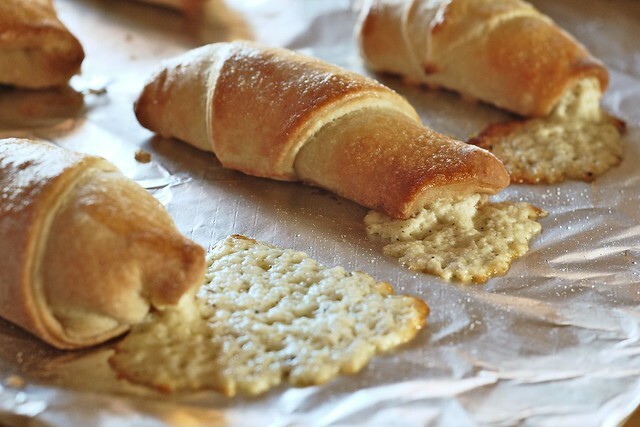 Also your caption on the baked cheese rolls made me laugh out loud. Thanks! Let me know if you make them and like it! I can alreay imagine the smell of this coming out of the oven. Yummy!